General Tso chicken is a common Chinese dish in the U.S. Sweet, salty and tangy, the chicken is battered and deep fried. I decided to try it using battered and fried mushrooms. It worked great! I also added onions and bell peppers, but they aren’t traditionally in the recipe. Broccoli is often served on the side which would be good too. I combined two recipes actually. Rasamalaysia (love her recipes!) for the General Tso sauce and basics, then this recipe for the batter. The batter was sooo weird but totally worked! I actually used it because it sounded so strange and I would recommend this dish just for the fun of working with the cornstarch slurry. It is like a paste, but sets up really firm, but then kinda oozes and moves. It is hard to explain. It was a bit hard to batter the mushrooms because the slurry would coat them but then slip off, but I found that smoothing the batter on right before deep frying was the best method. For the sauce, I found that I wanted more sauce and so I added more water. As long as coconut oil doesn’t clash with what we are eating, I use it if I am deep frying. Since it is an expensive oil, I use our smallest sauce pan and just enough so that half of the deep fried ingredient is submerged. Then I flip. Mix all the sauce ingredients together except for the cornstarch. Prep all the other ingredients so they are ready to go. 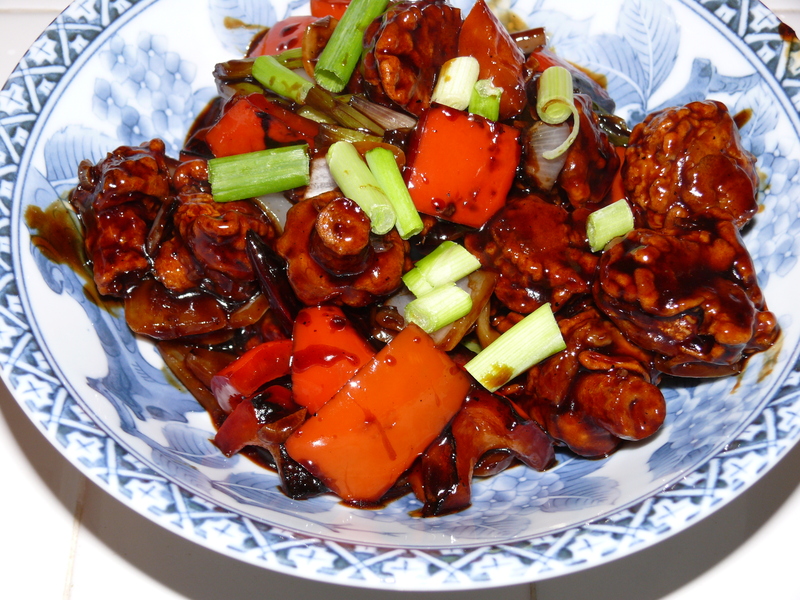 Heat coconut oil in a wok or other large pan and stir fry the red bell pepper onion until crisp tender. Remove from pan. I do this first because they take longer to cook and don’t want to burn the ginger and garlic. Mix cornstarch, soy sauce and egg together. The texture will be very weird! Heat coconut oil in a small pan. Batter each mushroom carefully and deep fry until crispy on all sides. I did big side down first, then flipped to finish the other side. 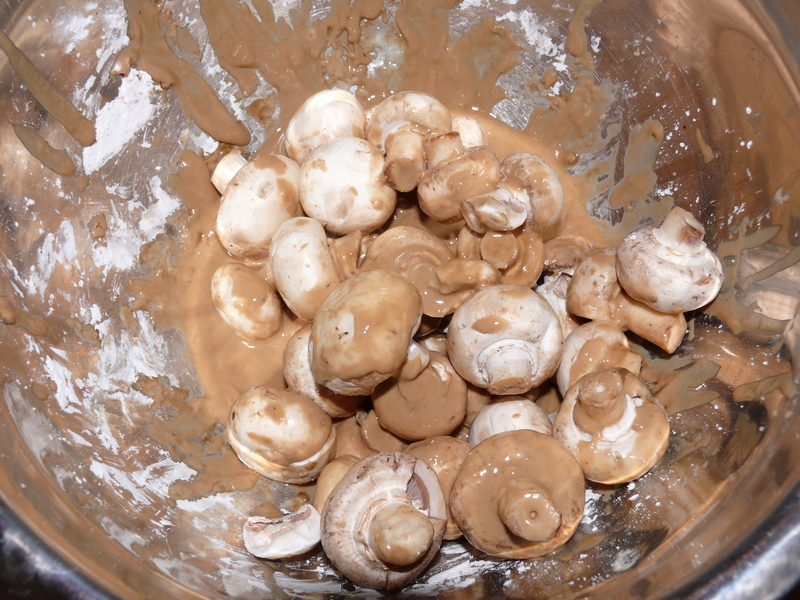 It took 3 batches to do all the mushrooms. Drain on paper towels. Heat the remaining coconut oil in the wok and add the ginger, garlic and the white part of the green onions. Once lightly cooked, add the red chilis and toast them a little. Add the bell pepper, onions, and sauce and bring to a boil. In a little bowl mix the 2-3 teaspoons cornstarch with a little water. Lower the heat a little and stir in the cornstarch mixture until you get the thickness you’d like. Throw in your battered mushrooms and stir. Top with the green parts of the green onions.